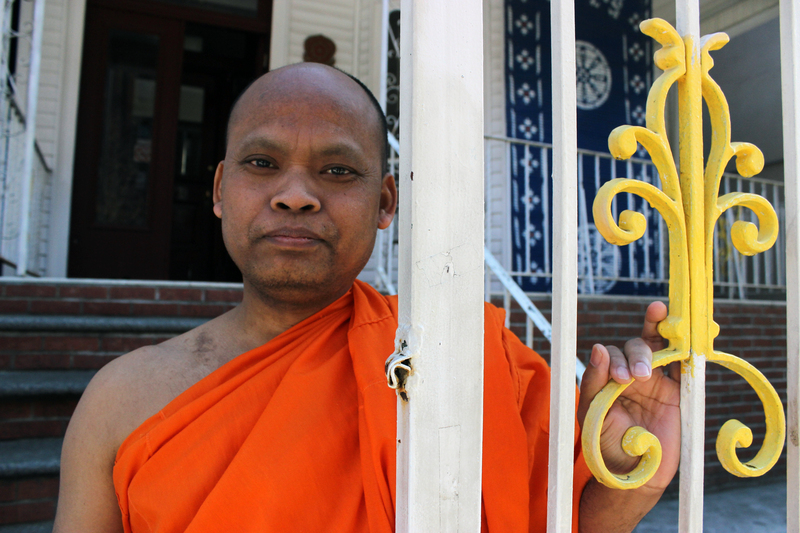 Kandaal Pheach stands outside Wat Jotanaram, a Cambodian Buddhist temple in the Bronx that has a rich & endearing history. Pheach is concerned about the temple’s future. 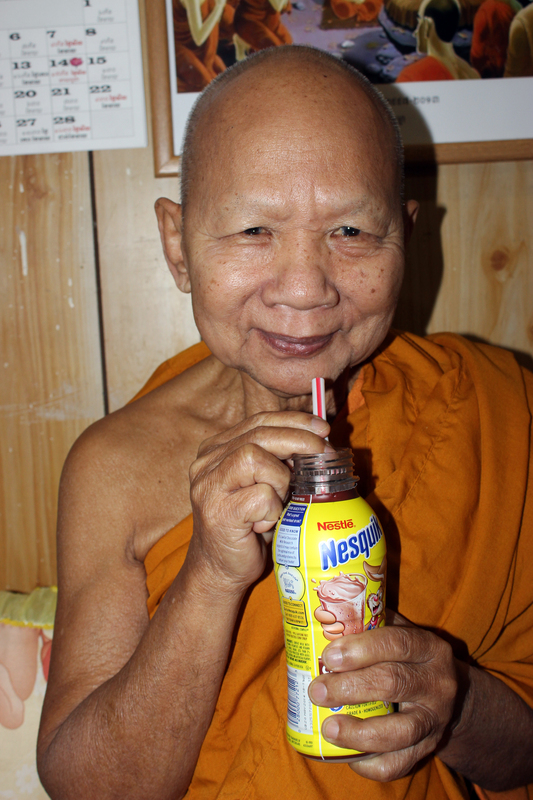 Pheach was recruited from Cambodia to for the position of head monk at Wat Jotanaram, also called the Khmer Buddhist Society, in 2001. EDITOR’S NOTE: Click here to see an updated version of this story published by Voices of New York in April 2014. NEW YORK — A drizzly autumn afternoon in the Bronx has camouflaged Morris Avenue in monochromatic grey — except for Sophouns Kandaal Pheach, a Cambodian monk clad in a vibrant orange robe. Pheach welcomes visitors into a gated, two-story property, then leads the way inside. “This temple is my life,” said Pheach, who immigrated to America in 2001. The house-like building he just ducked into is a temple, a community hall, and Pheach’s home, all under one roof. It is the Khmer Buddhist Society, or Wat Jotanaram, and beneath its ordinary exterior is a diverse pocket of Southeast Asian culture. As a house of worship, Wat Jotanaram caters to over 300 Cambodian Buddhists. Pheach leads group meditations on the monastery’s second floor, backed by Cambodian women who chant Khmer songs and prayers. In the lobby, Cambodian health care is underway, including treatments called kos kyhol, where a coin is lubricated in an herbal liquid balm then firmly applied to the skin to alleviate flu-like symptoms. Pheach, chanting Khmer & waving incense at his followers, helps lead prayers with three other monks at Wat Jotanaram. “This temple plays the most important role to free sufferings mentally, physically of my people. When the Cambodian community has unity, we can be happy.” Pheach added. Wat Jotanaram was purchased in 1985 by the first wave of Cambodian immigrants to arrive in New York. Most were refugees who had escaped the extremist Khmer Rouge government and Cambodia’s bloody genocide that claimed millions of lives in the 1970s. “Cambodian people suffer so much,” said Pheach, who arrived later than most Cambodians after the Khmer Buddhist Society recruited him in 2001. Pheach, however, wasn’t a refugee. His family remained in Cambodia following the genocide. At 19, Pheach entered the monastery and became ordained. He left his entire family behind to become the head monk here. Earlier Cambodian immigrants had little education, spoke little or no English and bore deep psychological scars from Cambodia’s genocide. 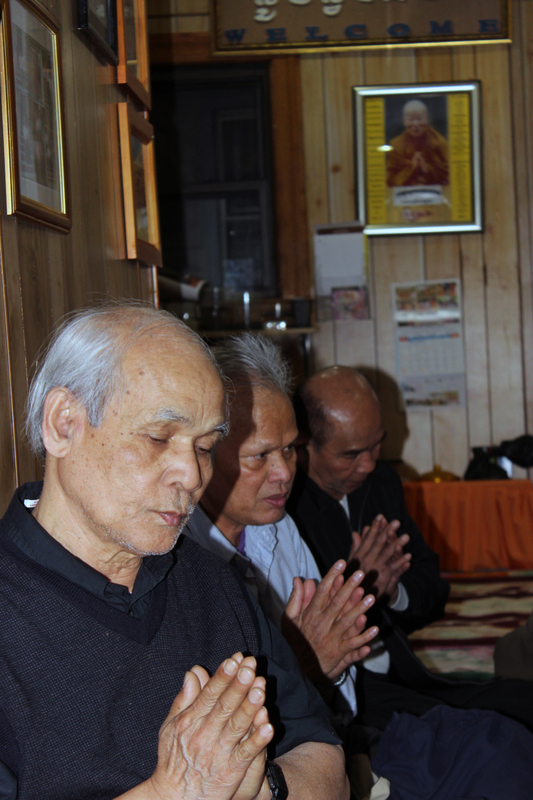 Lang Leang, 70, and former president of the Khmer Buddhist Society, was one of them. As a newly arrived refugee in New York, Leang got a job in a medical clinic, but the pay was so low that he was barely able to feed his family. Leang watched some family members starve to death, while he nearly did the same, hiding from the Khmer Rouge near the Thai border. Yet, despite their hardships, Leang and other refugees made it a priority to establish a temple. By 1985, the refugee community had raised $65,000 to buy the property that’s now Wat Jotanaram. The temple’s name translates to beautiful, peaceful, delighted, and shining place — and it’s a bridge between the new and the old world. Wat Jotanaram’s followers gather for worship on a Saturday evening. 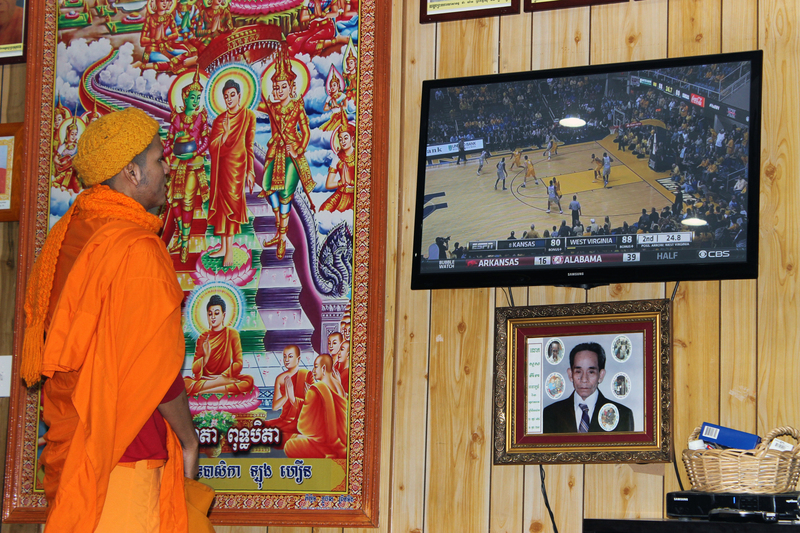 A young Cambodian monk watches a NCAA basketball game before prayers at Wat Jotanaram. Wat Jotanaram’s limited main floor space includes a kitchen, as well as dining & worship areas. This is Meas Vuthy, one of Wat Jotanaram’s monks. He’s 84-years-old & constantly smiling, one of the temple’s most kindred spirits. On any given day, you can find old Cambodian men sprawled on the temple’s vibrant carpets, watching college basketball on a lone television screen, while women prepare steamy fish ball soup in the kitchen, joking in Khmer as they stir broth and slice cilantro. They pray and share meals at Wat Jotanaram. Funerals, ordinations, and blessings are also often held here, and it’s where Pheach lives, as well, with two other monks. “The temple in the Bronx is a very critical cultural space,” said Pete Pin, a Cambodian photographer, who documented the Bronx’s diaspora community for The New York Times in 2012. Pin says that beyond its spiritual mission, the Khmer Buddhist society serves another purpose: cultural transmission. Pin, 31, who came to the United States as a small child, is not a Buddhist. However, he goes to Wat Jotanaram and other temples like it in America to learn Khmer, Cambodia’s traditional, but fading dialect. Sopheavattey Virak, 22, is an American-born Cambodian whose connection to her heritage comes largely through weekly visits to Wat Jotanaram. 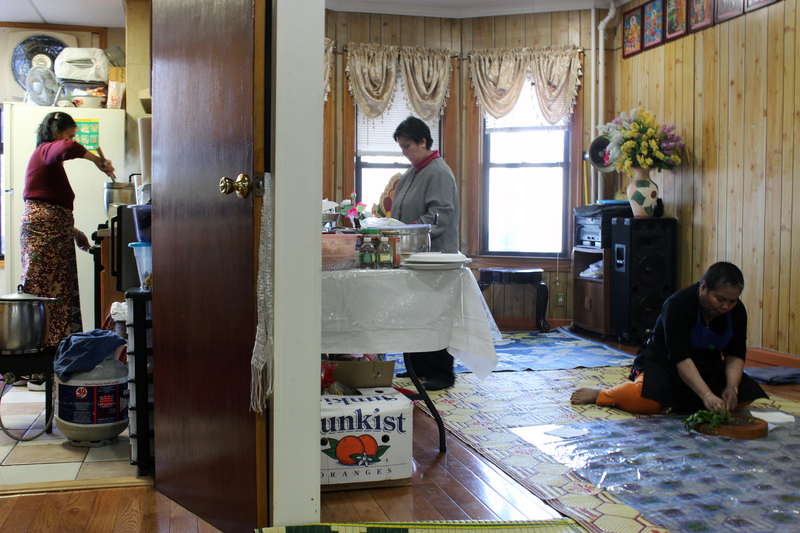 She’s one of the few followers her age who attend this Bronx Buddhist temple, where she has learned Khmer. “The temple means the place that the Khmer community comes to meet and join together. It also means the place that can make us feel calm and peaceful,” said Virak, who aspires to one-day return home to serve as Cambodia’s diplomatic ambassador to the United States. However, first generation Cambodian elders dominate Wat Jotonaram’s demographic of followers. Pin said this is reflective of most Cambodian Buddhist temples throughout America. Vetey Seng (left), 21, & Sandra Sok (middle), 14, discuss traditional Khmer language teachings with Pheach (right) following a meal at Wat Jotanaram. Sok is one of the Khmer Buddhist Society’s few young followers. “After a generation or so these temples will no longer exist because of a lack of participating Buddhists,” said Pin. Rottana Duong, 43, is another Wat Jotanaram worshipper, whose father, Chamroeung Duong, is the temple’s current president. Duong confirmed this trend and is troubled by it, too. “I’ve been living in this country for 30 years and I’ve seen a lot of Cambodians try to adapt to American culture,” said Duong. She thinks most young Cambodians sweep their heritage under the carpet in favor of a glamorized American lifestyle. “They start to lose their culture and also their religion, which is sad. So now they are more Americanized,” she explained. The second and third generations of Cambodian-Americans here are tasked with preserving their culture. The longterm survival of Wat Jotanaram depends on it. Yet, many Cambodians in the Bronx are disinterested towards something they feel they have little or no connection to. These Cambodian men represent the majority age demographic of Wat Jotanaram. “They don’t get what’s going here and they don’t understand the language,” said Sandra Sok, 14, whose wearing a black “I Love New York” t-shirt. Sok, born in the northwest Battambang Province of Cambodia, is one of the temple’s younger Buddhists who makes an effort to attend Wat Jotanaram with her family. She noted that most Cambodians in New York who are her age have a limited grasp on their traditional language, something she said discourages them from attending Wat Jotanaram where many of the worship ceremonies are performed in Khmer. “The prayers they don’t understand. They get bored when prayer is going on. They’re not interested at all. They think it’s better to stay home or something, and go on the Internet,” Sok added. Aside from the difficulty in recruiting young Buddhists, many community leaders in the temple are in their 70s and 80s, with few candidates in line able — or willing — to succeed them in their respective roles’ at Wat Jotanaram. This deeply disturbs Pheach, the temple’s head monk. Part IV of “Cambodians in New York” will return to Sleepless in Singapore next week with an audio & video story about my personalized journey into the world of meditation & why this sacred practice is central to Wat Jotanaram’s Buddhist followers in the Bronx. Reblogged this on Wat Jotanaram.